As crowds packed Tahrir Square in the centre of Cairo to celebrate the overthrow of President Mohammed Morsi on Wednesday night, three things filled the air - noise, fireworks and, unusually, laser beams. The use of laser pens has become a distinctive feature of the protests against the country's leadership, which began at the end of last month. 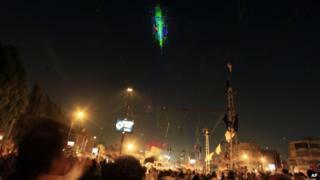 The mostly green beams of light were seen illuminating military helicopters as they flew over the square a few days ago. But the military were not the only focal point of the crowd's laser beams. After Morsi was ousted, some of the tens of thousands in Tahrir Square turned their pens on the balcony being used as a broadcast point by the BBC. BBC Middle East editor Jeremy Bowen was picked out by the green light of laser pens during this live report. TV correspondents filing for other broadcasters also got this new form of laser treatment. So why are they being used? Mostly just for fun, according to the BBC's Angy Ghannam in Cairo. "It started as a way to check the rooftops of buildings to get a feel if someone is there, such as snipers," our reporter says. "They are sold like crazy at the square. Street vendors are all over the place. "Anything at the square turns into a trend and a fashion in no time."